Prem Ramchandani Marg, which starts from the Taj Mahal Palace and extends till the Bombay Presidency Radio Club, was formerly known as Strand Road with the once-prominent Strand Cinema in the vicinity. “CHAI, CHAI, chai,” shouts a tea-seller, armed with a flask and a few paper cups, looking for customers among the crowd that arrives at the promenade by the Gateway of India daily. The promenade overlooks the sea which harbours ferries, speedboats and yachts. The street is bustling with activity – tourists galore, posing for the cameras and clicking pictures on their smartphones. Tempers flare as drivers of tourist cars and buses jostle for parking space on this narrow stretch. Prem Ramchandani Marg, which starts from the Taj Mahal Palace and extends till the Bombay Presidency Radio Club, was formerly known as Strand Road with the once-prominent Strand Cinema in the vicinity. It was rechristened to commemorate the sacrifice of Prem Ramchandani, a Flying Officer in the Indian Air Force, martyred in the Indo-Pak War of 1965, who was a resident of Colaba. “Tourists who visit this area like to get their photos clicked with the Taj Mahal hotel, the Gateway or the seaside in the background,” says 45-year-old Ranjit Kumar Das, a photographer at the Gateway of India for the past 28 years. Das, who charges Rs 30 for a photo, has a portable digital printer to print the photos instantly. City historian Deepak Rao says the entire strip of land belongs to the Bombay Port Trust as part of the Apollo Reclamation Scheme, 1905. “This stretch housed some of the wealthiest people and the beautiful structures on the promenade were primarily inhabited by the British and Europeans. Some of the residents were either officers of the British Army or Navy or were associated with the Port Trust. The Indians who lived there either belonged to the ruling families of princely states or were members of the elite Indian Civil Services,” he says. Rao says besides the Taj, it is pertinent to note that all the buildings along this street are about the same height. Some of the prominent buildings include the Northcote Nursing Home, which was once a guesthouse eventually converted into a hospital, until it closed a few years ago. The Anchorage, owned by the Wadiyar dynasty of Mysore, saw its ownership transferred to a major public sector oil company. In the 1970s, a campaign led by conservationist Heta Pandit was initiated which was successful in preserving Evelyn House, another building on this street from possible demolition. Belha Court, which also lies on this stretch belongs to the Nawab of Belha, an erstwhile princely state. The Marina Upper Deck on the terrace of the Sea Palace Hotel, formerly known as Hotel Gourdon, offers its patrons a spectacular view of the harbour and the promenade over a meal. Strand Hotel, which is housed at Kerawalla Chambers is another establishment which operates for tourists visiting the area. 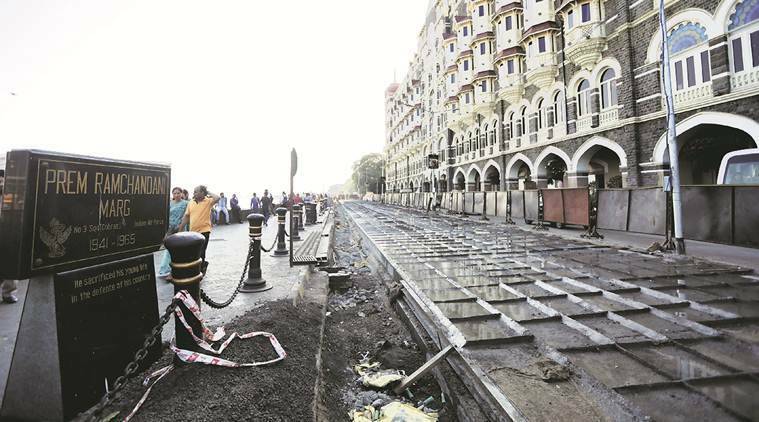 This road, which ends at where the Bombay Presidency Radio Club stands, used to also witness horse – drawn Victoria’s ferry those who fancied a ride along this stretch, until it was banned by the Government a couple of years ago.